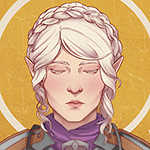 A young, though particularly well-mannered, blonde paladin of Tyr has been seen around Beregost often over the last ten-day and is said to have been staying within the walls of the Lathander temple. Those within it's walls seem to be quite fond of her willingness to help and her warm-hearted nature, treating her as if one of their own. Some wonder what a girl of such youthful innocence is doing in such a place but rumor has it, her vigilance and dedication to duty has been noted. She is said often keeps a close eye on the streets and Inn for trouble, quick to spring into action should she be called upon. [x] Lady Cecilia Lafayette: Harbinger of Hope, returned to Cormyr. Ex-Main 1350-1353DR. Retired. [○] Mara Stormwind - Former Hellstorm Quartermaster; Captaining 'The Spirited Storm'. Alt. Retired. [x] Leyla El'uvian- Feral elf, abandoned society for a loving den in the woods. Alt. Retired. As dawn arrived, and the sun broke the horizon near Beregost, joy filled Brennan's heart. It was a feeling he felt each morning in fact, each day a new day, each dawn a reminder of Lathander's power to overcome darkness. He sat in quiet reverie, recalling the days past, acknowledging all that had occurred, the good and the bad. He was thankful for new friends, thankful for the opportunities to foster the rebirth of so many, and so much. He sat at the edge of a town that was outwardly at peace, but buzzed chaotically underneath. He sensed a great bit of volatility and unrest. The townsfolk seemed divided, those traveling through seemed almost hostile, and the town guard had been cracking down with extreme brutality reminiscent of the Zhent usurpers of his homeland. This sort of uncertainty may have even worried others, but he had faith that no matter how dark the night, Lathander's dawn always shone through in the end. He knew that Lathander had led him here for a purpose. The lieutenant-commander of Beregost's templars, Eldarian Al'maire, left the Song of the Morning temple late in the afternoon, carrying the unconscious form of Tolan Faeglin out into the streets of Beregost. Tolan was dressed only in breeches, while Eldarian was clad fully in armor. The sense of despair off Tolan was almost palpable as the pair walked through the streets, the sun peering down at them through the rain. They were outside for some time before returning to the temple. Smiling weakly, Kitten departs Aiden's company, walking through the town of Beregost, nodding a little with a small smile to people as she walked. As it starts to rain, she walks through the town in a blue dress, finding her way into an alley before she leaned against and slid her way down the wall, sobbing to herself in a fit. This continues for a time before eventually it would passr, she wipes at her eyes as she wanders out of town, rubbing at her eyes. The Acolyte of Candlekeep, identified by some as Ayla, left the temple earlier in the day and headed north out of town. She arrived back a few hours later, seemingly in a good mood and went back into the temple. Those who have kept an eye on the temple in the past couple of days saw her leave the temple again after several hours, headed for the inn, looking tired, but smiling. Shortly after Aylas departure, a templar of the temple was seen rushing out and through the town, looking for someone. He eventually spotted the lieutenant-commander and set out after him, calling for him to stop. They both left town through the southern gate, but returned a short while later and headed to the temple. The joyful expression on the templars face have some speculating if Tolan have recovered, though nothing is confirmed by the temple yet. Locals Ed, James and Raymond and Marj were seen being dragged into the temple of Lathander yesterday by a very displeased Captain of the Guard, Antonio was was also said to be bleeding from beneath his pauldron. The men were bruised and battered and were said to have been treated by a Cleric of Ilmater while inside. It's rumored the men were originally sentenced to prison and for one, death, for charges of gambling and attempted murder, though upon leaving the temple their sentence was mercifully reduced to labor and prison. Four bodies were seen being dragged by a troupe of adventurers into the temple of Lathander, of which were identified as two halfling and two human. The bodies were, unfortunately, not fresh and had already begun to rot. They could not be saved. Talk is circulating of white hand prints found on the victims and whispers of the orcish deity Yurtrus can be heard within surrounding taverns. An arrest of one 'Captain' Kalma Hellstorm was made outside the temple of Lathander yesterday by a young female Paladin of Tyr after a confrontation on it's steps. He was seen harassing a teifling woman in the steet, and soon after a golden genasi disciple of Lathander ]. Witnesses say Kalma began to talk of the temple being the home of heretics and that any who do not respect 'the Queen of the mystical Depths' would have doom reined upon their soul. The Lathandrite Templar, Brian, was heard to then advise Kalma to move on from the steps of the church. After due warning, the Templar was resorted to force and at which point was slain. After the murder of Brian Kalma was taken down by a town local with the assistance of the temple of Lathander and the Tyran Paladin. The Lady was seen clasping the man in irons and dragging him unconscious toward the Garrison. The man was soon after released with no charges made and though still bound by the Paladin's shackles, less coins seemed to ring in his pocket. An aura of unfinished conflict hung in the air surrounding them as they each went their separate ways. Today Tolan, rumored to have awoken at last, was seen walking through the town with the aid of several different individuals, thus confirming the rumors. He was seen going into the local tavern and staying there for some time before going outside again, still supported by others. He eventually returned to the temple looking rather exhausted, though given the rumors concerning how he got injured, most did not find this strange at all. If anything, it was strange to see him up and about. While he may not be ready for active service yet, some speculate that he will be making more appearances in the town in the comming days. After some trouble in Beregost involving a certain half elven recruit of the Silver Shield adorned in a cloak with a red cross on it was seen meeting with some of the Councilors from the Silver Shield at the Friend Arm Inn. They disappeared inside the inn for some time and it is said once they all left the inn that the recruit looked furious and her cloak was missing. Days later the Councilor could be heard discussing that trouble with the guards would not be tolerated under any circumstances with his men. "Dead?" Lips murmur in horror and disbelief. Whispered rumors are spoken throughout the town of Beregost that the Dawnknight, Eldarian Al'maire, has been pronounced dead by the Song of the Morning temple. Each and every search for his whereabouts turned up inconclusive, so it is said that the temple decided to rely on faith to shed light on the matter. A ritual seemed to reveal that Eldarian's soul was no longer on the Prime Material plane. This information seems to be corroborated by a druid, a day later. The body of the lost paladin remains missing. Auric Blackmore: There are no facts, only interpretations. Retired. Lord Eldarian Al'maire: Darkness retreats, a coward before the sun. Hoihe is seen around Beregost, eyeing some citizens with contempt, however, he seems too busy around the Morning Song Temple, meeting with some of the priests. He would often examine the location of where the human skin was hung, muttering: "Aberrant fools.."
"The desire to build a house is the tired wish of a man content with a single anchorage. The desire to build a boat is the desire of youth, unwilling yet to accept the idea of a final resting place." "The wind and the waves are always on the side of the ablest navigator." I sit back in my armchair thoroughly amused by what rumors I hear floating around Beregost these days. It seems to me that too many of those who claim to be agents of good and justice, are so blinded by revenge that they they are seriously considering putting an innocent man on trial for his life due to actions that are mine alone. Understand this authorities of Beregost, you have taken what does not rightfully belong to you. These are OUR streets and our demand is simple. Cease your crack down on the Gamblers Dens or face our wraith. Good peoples of Beregost, you are being occupied and spied upon by a foreign corrupt power. The Amnian forces and the Temple of the Morninglord do not care about your safety or well being. These corrupt powers collude to keep you impoverished while they use your town as a military barracks to pursue their imperialist agenda. Do not fall into their web of lies, join the resistance and tell these Amnian dogs to go back home! The one known as Eldarian was my first example. I spotted him having a spirited argument with the one known as Kahanak before both men shook hands and left. Afterward, I had one of my agents pulverize the paladin of Lathander before disintegrating his carcass. I only promise more bloodshed to come until our demands are met and the Governess recognizes our privileges within the town of Beregost. My agents are everywhere and we will bleed all you imperialist scum dry with a thousand pin pricks. We rebels fighting for the cause of freedom will not tire in our pursuit to unshackle the good peoples of Beregost from the chains that the Governess, and the hypocritical priests and lords of the Morninglord Temple have placed upon them. Most of your bounty hunters will tire of following my trail, and the ones lucky enough to find me will have their heads sent back as proof of their failures. All of this bloodshed can be stopped immediately if the Governess meets with us to negotiate a truce. "Shhh! Pay the shadows no mind." "With Ubtao as my witness, I shall find the evil that plaques my land and put an end to it." Come morning, Thomas left the temple as normal. A round little pig followed quick on his heels, squealing with delight as it watched its breath mist in the winter air. The priest smiled affectionately down at the animal, before quietly approaching a small gathering nearby. Something seemed to have brought a group of the townspeople together, and there was busy, half-whispered conversation thrumming through the throng. The last time that this had happened, it had been the flayed skin of some unfortunate soul gathering gawkers -- the human hide scarred with a cultist's mad ramblings. Thomas was naturally concerned that this is what he'd see once more. It was, then, with some relief that he saw it was merely an open letter addressed to his temple and the authorities of the town. Reading over the pamphlet, he smiled, sadly, and gently tore it down. Turning to the crowd, he carefully climbed atop a few crates and looked out over the worried people all around him. "Good morning everyone. You all know me. In fact, many of you grew up with me -- or watched me grow from boy to man. Those of you who are newer to town may not have such long memories, but you have surely seen me all the same. Maybe you have come to me for healing, or counsel, or words of encouragement?" Thomas hops down the stack of crates, like a child dances from stone to stone to cross a creek. It is careful and carefree at the same time. And it brings Thomas to the people, who he continues to address, letter in hand. "This sorceress says a lot in her letter, doesn't she?" He smiles to the faces that turn to regard him. "Parts of it amuse me. For instance, she accuses us of being blinded by revenge?" He searches about the crowd, and finds someone he knows. Moving to the man, he gently places his hand against his shoulder. "Raymond! Do you recall when we were children? And I had built a snowman over by the orchard hills? You were sledding with some of the other boys our age. And the lot of you decided, borne on by the harmless petulance of youth, that you would knock over my snowman." Raymond grins a bit sheepishly, but Thomas continues. "And you did. And I cried. Oh how I cried," he laughs softly, smiling back over the crowd, after gently releasing Raymond's shoulder. "But I didn't seek vengeance. In fact, I begged Raymond and his friends to help me rebuild my snowman. The snowman was to be a special surprise for my younger brother, I explained, and he would be arriving any minute. So you know what they did? Moved by my plight, they helped me build two. One for me and one for him." Thomas moves back to the crates, but this time only climbs atop one. "Do you know why they did that? They did it because that's just the way we are here in Beregost. We help each other out. We may not always do what is right on the first try, mind you. But when the push comes to shove, we stand for each other." Thomas lifts the letter above his head. "Do you know what annoys me the most about this letter?" The priest asks, frowning slightly. "Even more than the faulty logic, the false words, or the fact that this poor woman is hurting inside, and in need of Lathander's love?" "What annoys me most about this letter is that she claims the streets of Beregost belong to her, and her organization." He says these words low, with a deep sadness in his voice, shaking his head as he speaks. "But these streets do not belong to her -- or to anyone else who makes threats against our town." Thomas raises his head, his green eyes on fire. "These streets, these streets of morning gold, belong to you! You! The people of Beregost! And let it be known that no one will ever take this town from those who live here, and work here, and raise their families here. No. We will work with Captain de Coibra, the governor, and the high priest, Most Radiant Kelddath Ormlyr, to make sure that this town is safe and secure for each and every person who calls it home. "Because that's what Beregost is to us. It is our home. And anyone who threatens to spill blood here has no idea what a home is worth to those who live there. Take heart, 'good people of Beregost,' for we have them on the run. Those who would take advantage of us while we are weak. Those who would prey on us while we are hurting. They lose influence daily, and grow more desperate as the gravity of their situation dawns upon them. Aye. Aye. It seems we, the people of Beregost, are finally at the cusp of a new day!" With these words, he descends the crates and moves to the town hall, intent on sharing some intelligence with the good Captain on this particular flyer and the people behind it. Later that morning, Thomas and others sworn to the temple -- as well as any volunteers from town or from elsewhere -- would be seen calmly clearing the flyers. "J'avais cru plus difficile de mourir . . ."
I had imagined it was more difficult to die . . .
A slim figured male wearing a silk grey vest and black pants quietly lingers toward the back of the crowd, leaning casually against one of the buildings with his hood pulled low over his face as he listens to Thomas. At the end of the mans rousing speech his hood would dip in an appreciative nod and glance around at the townsfolk, seemingly trying to gauge their reactions. As the crowd disperses he would linger for a little while longer, idly smoothing his vest as he loiters, but otherwise not moving to engage anyone. Once the clean up of the flyers had begun he would move over and reach up to gently pluck one of the posters from the wall. Flipping his black cloak behind him a little, the figure can be seen glancing over the Red Sorceress' poster, his hooded head travelling left to right as he reads. Once finished, his shoulders appear to heave in seeming silent mirth, and he might be heard to exclaim in a hoarse and raspy voice, "Such audacity... it never ceases to amaze me how these types manage to put up so much hipocritical rubbish right in plain view of the guards..."
The hooded figures head swivels towards the armored Lathanderite guards then and his small shoulders give a slight shrug as he moves off, releasing the poster over the trash bin as he glides away in the direction of Gullykin. In the recovering town of Beregost, citizens are worried about a commotion that happened in the Mayors Manor. Many witnesses say a youthful and beautiful woman known to many as Cecilia Lafayette entered the Manor but no one saw her leave. As authorities investigated the Manor, they found signs of struggle with broken glass and furniture strewn about in the foyer. Many are worried for her safety and the town guard is seemingly on high alert.